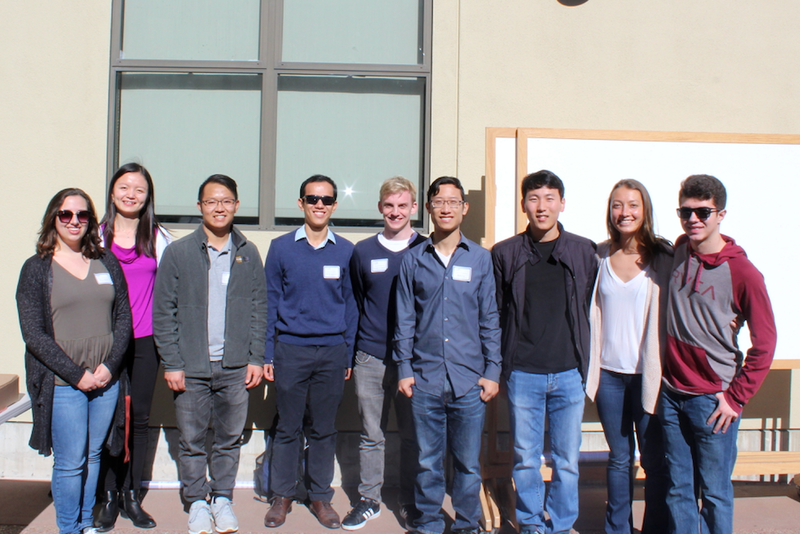 Held on a sunny winter day, the ChE GSA, in collaboration with the undergraduate AIChE chapter, hosted the inaugural Graduate Research Fair on January 25, in the Engineering II courtyard. Developed as an opportunity to showcase the graduate student research in the department, the fair is also a forum to help undergraduate chemical engineering students explore research opportunities within their department. Twenty presenters gathered to showcase their research posters, including Jimmy Liu, Chad Wangsanuwat, Patrick Corona, Sean Gilmore, Alex Chialastri, Anirudha Banerjee, Ryan Ley, Jacob Monroe, Lesley Chan, Chithra Asokan and Ji Qu, Jiamin Zhang, Susanna Seppala, Abe Pressman, Tuan Nguyen, Nick Sherck, Clarke Palmer, David Smith, Jan Garcia, Kartik Kamat, and Zach Berkson. The posters covered an array of research fields, including Materials and Interfaces, Bioengineering, Energy Efficiency and Sustainability, and Modeling Theory and Simulation. 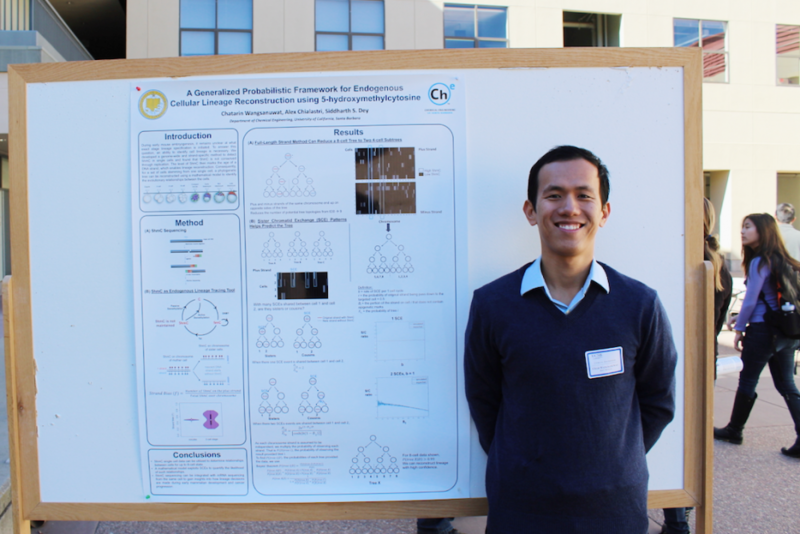 The award for Best Poster went to Chatarin (Chad) Wangsanuwat of the Dey Lab, for “A Generalized Probabilistic Framework for Endogenous Cellular Lineage Reconstruction using 5-Hydroxymethylcytosine”. Best Presentation was awarded to both Jimmy Liu of the Fredrickson Lab with “Coarse-Graining Polymer Field Theory for Fast and Accurate Simulations”, and Patrick Corona of the Helgeson and Leal Labs, for “In Situ Structural Measurements of Soft Materials in Arbitrary Deformation Fields”. The winners of the inaugural event were judged by undergraduate students who attended the research fair. Lunch was also provided to poster presenters, and poster prizes were awarded. Congratulations to all of the presenters, winners, and to the ChE GSA and undergraduate AIChE chapter for a successful event. Winners, GSA PD Chairs, and AIChE Officers (photos courtesy Jiamin Zhang).